It was only last week we paid a glowing tribute to the new cricket management for a job that was being well executed. We always believe that when the top is strong it is not difficult for the message to cascade or even a slithering slimy stone to convert itself into a solid hard rock that could withstand pressure knowing that if the job is well done it will be mirrored all over. You just do not have to keep opening cupboards to look for good results – the job of cricket was passed on to good hands and the players on the field are performing with new vigour. The athletic catch that Angelo Mathews and Mahela Jayawardena combined to complete just talks of a team that is well tuned and battling its way ahead. Never in the living memory of modern day cricket, has a catch being completed in that manner and this was not the first time that Mathews had raised the eye-brows of the cricketing world with a catch akin to that. Sports Minister Mahindananda Aluthgamage at the inauguration of the new Interim Committee led by Upali Dharmadasa unequivocally pronounced that after six months he would call for elections to choose office-bearers to govern the cricket of this country for the following 365 days. Maybe down the line of executing their duties, our cricketers may come upon a bad day at work, but, that does not mean it is the end of the world. They are a good set of cricketers and they know the performance that keeps them afloat. Besides that, while engaged in friendly banter with a top official of the cricketing citadel last week Musings learned that things are going in the right direction and the persons who are entrusted with certain chores thus have the freedom to accomplish them with a little or no interference. Yet we, at this end, keep wondering whether this group of people are aware that they have less time to execute their vision than the time it takes to for a woman to bring forth a child to this world. A six-month period is a limited time for the new administration which is doing well and still questions are being raised whether there is an agenda behind the agenda. 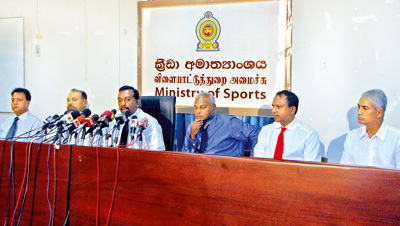 This team led by businessman Upali Dharmadasa is well aware and it was unequivocally stressed by the Sports Minister Mahindananda Aluthgamage at their inauguration that after six months he would call for elections to choose office-bearers to govern the cricket of this country for the next 365 days. Yet is it clear that if this management does a good job within this six months -- hardly a term to show their colours -- would Upali be called upon to run for the chair with his team or there is some embryo who is being hatched in the heavens or else it would be a free for all where dog eat dog and the wily cat survives. Or else would Upali want to run for the chair even against the wind? It is no secret even on the day Upali Dharmadasa was inaugurated at his position as the new Interim Committee Chairman of Sri Lanka Cricket it was not only the media that was gathered there at the sports ministry. Walking down the corridors and assembling small gangs were the scum of cricket who has made a living out of it. These parasites have lived with the game for the past few decades and fattened themselves on it with ethics or human qualities not being their concern. They flaunt their votes to a highest bidder or what they can get out of them. Down the line these characters have also built a certain skill and they have managed to work in such a line where they are responsible for a block vote and sometimes it may run to more than ten. It is said that the SLC vote count runs to 145 votes and the break down reads as 23 affiliated members @ one vote each; 29 controlling clubs @ 2 votes each; 21 District Associations @ 2 votes each; six Associations @ 2 votes each and five provinces @ 2 votes each. Yet it is learned that the king maker who designs and shapes every movable and immovable thing in this country holds a block vote of 46 votes which is only 28 votes short of the number of votes required to win. Then there is another individual of the previously mentioned quality who holds a block of 17 votes. He has gone on record boasting at a VIP gathering – “I am not playing the fool. I have come here with a total of seventeen votes. If you want them, take me seriously or else I go where they would take me seriously”. We learn that this person who has allegedly cooked the accounts even with regard to packets of meals that is given to labourers during international matches is hard at work even at this Australian tour of Sri Lanka. So we learn that pressure gets into even a crystal sculpture. Then there is also a person who holds a block of fifteen votes, but, yet his credentials are no better those of the man of seventeen. He then brought forward the example of former Sri Lanka skipper Arjuna Ranatunga bid to the cricket’s hot seat. “He came with the cricket World Cup and a load of good intentions. But, he did not want to run with the existing system. So at the end of the count he ended up with seven votes to his credit. So he too learned that it is only a different game that would bring him to his desired seat and he just did that”. After all it’s only the cup that matters!